ISI NV – 6 string Eric Aceto is now specialized in (amplified) acoustic instruments. 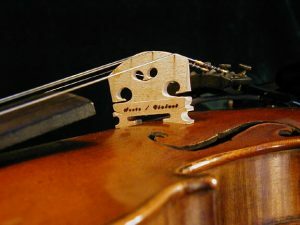 He had exciting times working with Ned Steinberger before, making solid body violins. 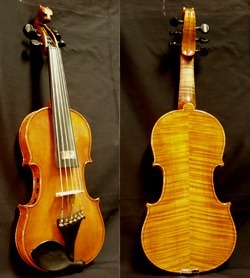 ISI violins are visually very similar to acoustic violins, except that in the NV / NVC models the f-holes, bass bar and sound post are missing. The body of these instruments is focused on tone production towards the pickup. The NV instruments are designed to be plugged in, and are perfect for high volume situations. Though the NV has no bass bar, sound post or F holes, it does have a well developed tuning system consisting of top graduations, bass and treble bars and side air chamber tuning ports. “I’m sold. I have been playing Ithaca Stringed Instruments’ NV viola for a couple of days. Nothing comes close. It actually sounds like a viola; not just like, but better. I liken these instruments (Zach Brock plays one) to an archtop jazz guitar. Electric, but expressive and rich in color. I also know from performing with Zach that the well-defined character of the fiddle helps it cut through the blend. Since it has a strong color of its own, it is less dependent on which amp or speaker on uses. Also from experience, I know it sounds great with effects piled on, including distortion. The years I have spent trying to get expression and color into the sound of my solid body Barrett paid off with this axe. It has all the color range of my orchestra viola with a wider dynamic range and great definition during fast runs of notes. Sounds killer with NO effects, even better with some ‘verb or echo. If you’re going to be playing rock or country, solid bodies make a violin-ish sound and are affordable and robust. If you want more, for jazz or anything where you need presence and expression, this is the answer. Expensive but in line with the tag on any professional. The Strad of electrics, I’d say … What I love about this instrument is that it plays like an acoustic, only better. Same rich colors, but faster response.” The Artist Model, Eric’s current focus, is a much more subtle instrument, and is probably at the top of the amplified violin range. Eric Aceto’s instruments are extremely positively received by famous players such as Jean Luc Ponty. In a Strings Magazine article Darol Anger wrote about the N.V. model: “Here’s a tip about a new instrument that, tonally, is one of the best electric violins. Eric Aceto’s NV five-string electric violin is a must for the regularly performing professional violinist who absolutely has to play amplified and for whom tonal nuance is critical. Its builders have departed from conventional wisdom about amplified tone by envisioning the pickup and body as a dynamic unit, and by making changes in the body to modify the pickup’s sound. Eric himself plays a lot in various jazz and folk and experimental music situations. He strives to focus on constant improvement in the sound look and feel of his instrument designs: “For me, the visceral experience of playing a quality violin is the benchmark and placing that in the context of an amplified situation is my goal. 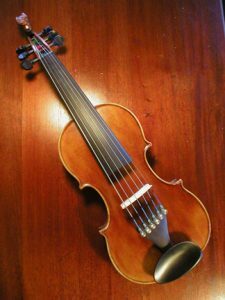 I built my first electric violin in 1975 while playing in an original music band and having dissatisfaction with my 5 string Barcus – Berry violin. Even though that instrument was the best available at the time, it just did not have the feel and tonal pallete I was looking for. The development of the Aceto/Violect pickup was an important step for me. This pickup is very sensitive and faithful to the instrument it is on, so it has enabled me to hear more of what the instrument itself is doing. Eric also does a lot of custom work for people with particular desires or needs in an instrument.